Have you ever created a manifesto? “A written statement declaring publicly the intentions, motives, or views of its issuer.” A manifesto can be what you stand for, your non-negotiables, your goals, likes, and dislikes, right? It’s kind of an official summary of who we are. So in that case, most of us have a lot of experience with personal manifestos. Dating profiles and social media apps publicly declare who we are in photos, family and friends, and our curated and shared lives. As an entrepreneur, and in branding my business, a lot of thought has gone into my policy and aims as a personal chef/caterer. In January of this year, a friend insisted I move mountains to make it to the art installation in New York City of the Australian film piece titled Manifesto. I haven’t received a rave like this in years, so I took it to heart and my ‘schedule mountains’ shifted… and I made it. Manifesto had been scheduled to be in NYC for one month only. I scrambled in to see the last two hours on the very last day before the exhibit was closing and coming down to move somewhere else. Better late than never, truly. Did you hear about it? Did you get to see it? I’m glad I made the effort to go. I love art installations and see most everything that comes to town. Cate Blanchett brilliantly embodied so many different people. They were unbelievably diverse, but all had the common denominator of a manifesto that needed to be expressed. I took pictures, I made mental notes – it was very inspiring. But I wanted more. I wanted to leave with some profound "Aha!" I knew there was a reason I was urged to go and that the universe rearranged my schedule so I could attend. But why? What reason? For the past three months these photos have lived in my phone, I think about the exhibit often and wondered when I would be struck with an ‘Aha!’ and want to share about it. I know not everything has to have some deep meaning, but I had placed value on my friend’s recommendation as well as my efforts to get there in the nick of time, so I was determined to mine it for something of worth. I’ve mentally titled it and have kept a running tab in my mind of my ‘intentions, motives, and views,’ as I create this new life for myself. It’s nothing too profound. In fact, it’s pretty basic. I call it Take Care. We say that so often, during goodbyes, signing off on letters and texts, sending good wishes when someone is going through a hard time, as an instruction to a loved one. I say it all the time and don’t really get specific with the wish. Do you? I’ve lived for only one week in my lovely new home in upper Manhattan and already there are small, subtle changes that have made me feel like I’m taking better care of myself, and my space. I’m so much more intentional and deliberate. In my old apartment I was complacent and going through the motions a lot, kind of just getting by. When we take better care of ourselves, we instantly are taking better care of those that we love. We show up more vibrantly, with more presence, and as healthier and happier beings. And when we do that, we are making an impact on a whole world of strangers that we may never meet. Because taking better care of our loved ones, makes them show up healthier and happier in their families and jobs. It’s a trickle down effect with results that actually lift UP everyone. I feel like this spring is my new year, my new season, my starting over. I want to make sure that all of my efforts are in some way taking better care of Me, the planet, You, my clients, my relationships. Less waste, more uses for things. Less procrastination, more action. Less hate, more love. Leaving on time, making my bed, making eye contact, saying thank you, holding open doors, smiling more, cleaning as I go, turning lights out on a clean kitchen, more sleep, less time online…my list goes on and on. Street artist Morley giving out cues for living life! The word manifest comes from the Latin word manus which means hand. So when we manifest something it means, ‘placed in the hand.’ That reminds me of a magician making something magically appear. I invite you to think about your own manifesto and let it bloom this spring. May our actions and intentions place our hopes and dreams in our hands and hearts. Take care, my friends! This recipe is something I’ve implemented into my Take Care philosophy. Slow down, get cozy, make a cup of tea, be still with your body and your thoughts. I created this antioxidant tea for Stoneridge Orchards using their dried tart cherries. 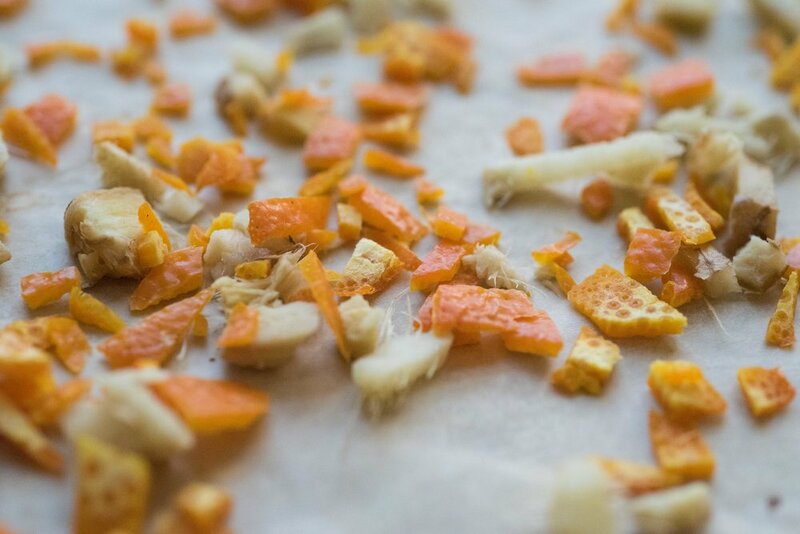 Toss orange zest and ginger together on a large parchment-lined baking sheet. Scatter mint on a second parchment-lined baking sheet. Bake until ginger and mint are both dried, rotating sheets and stirring occasionally; approx. 10-15 minutes for the mint and 45 minutes for the ginger mixture. Crumble mint into a medium sized bowl. Add ginger mixture and cherries. 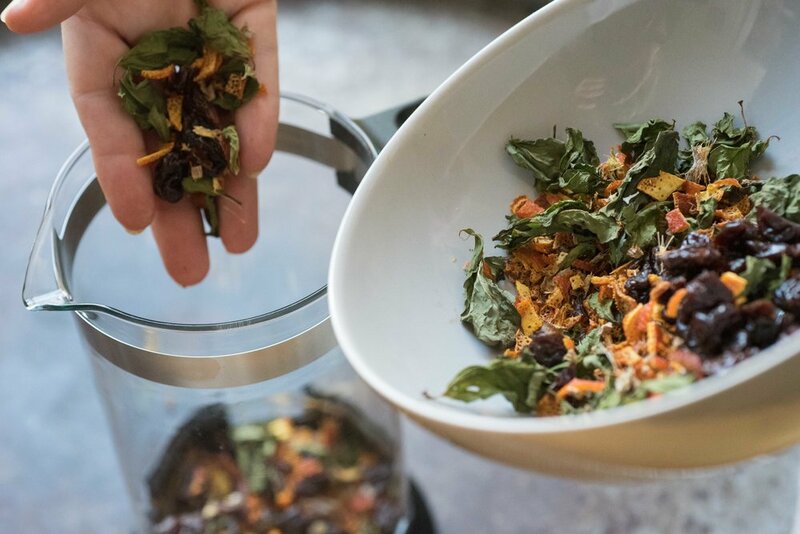 For each serving of tea, steep 2 tablespoons of tea mixture in 1 cup hot water, 3-5 minutes. Strain and serve. The stunning tea photos are the work of Cheryl Stockton of Stockshot Studio.